A man who attempted to travel to Syria to join so-called Islamic State (IS) has been jailed for six years. 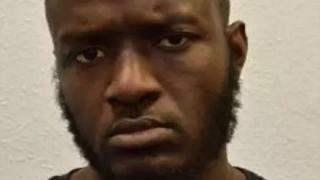 Patrick Kabele, 33, was found guilty of preparation of terrorist acts, at Woolwich Crown Court. Kabele, of Willesden, north-west London, was stopped at Gatwick Airport on 20 August, as he attempted to board a flight to Sabiha Gokcen Airport in Istanbul. Media devices which revealed his plans to fight alongside IS were seized. Commander Dean Haydon, of the Met's Counter Terrorism Command, said: "Kabele's intention to join ISIS is made very clear in his own notes. Kabele was also ordered to serve a further four years on licence when he is released.